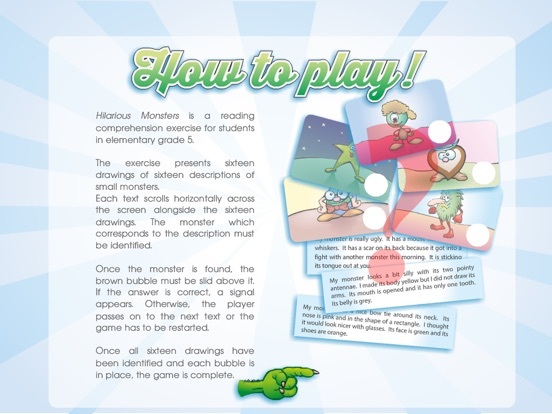 The Hilarious Monsters game is a reading comprehension exercise for Grade 5 students. 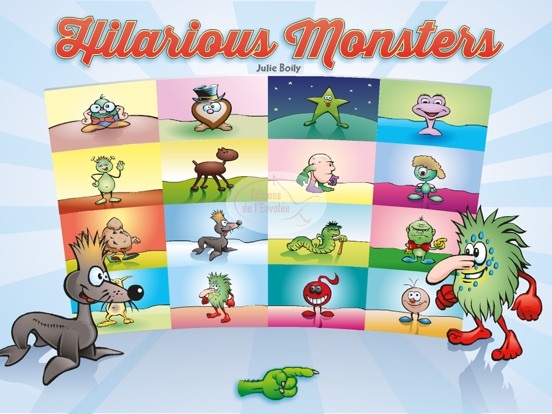 Easy to use, Hilarious Monsters is created especially for children. The game is divided into 16 exercises, each containing a series of images and a description of a character. The exercise presents sixteen drawings of sixteen descriptions of the small fish that inhabit Grandpa’s funny aquarium. Each text scrolls horizontally across the screen alongside the sixteen drawings. The fish which corresponds to the description must be identified. Once the fish is found, the water drop must be slid above it. If the answer is correct, a signal appears. Otherwise, the player passes on to the next text or the game has to be restarted. Once all sixteen drawings have been identified and each drop is in place, the game is complete.